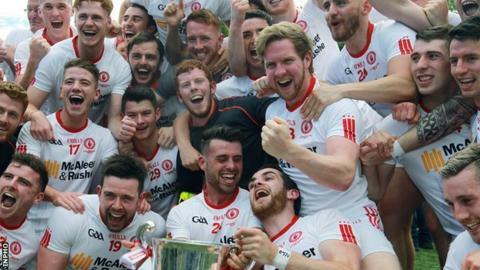 Tyrone won their 14th Ulster senior football championship last year but can they retain the title? Martin McHugh has backed Monaghan to be crowned champions at the end of this year's Ulster Football Championship on BBC Sport Northern Ireland. Malachy O'Rourke's side are bidding for a third Anglo Celt in five years and feature in the first of seven live games in Saturday night's preliminary round tie against Fermanagh at Clones. BBC Sport NI will be there with comprehensive TV coverage, live commentary of all the games on BBC Radio Ulster and, features, analysis and reaction on bbc.co.uk/sportni. "You have Monaghan, Donegal and Tyrone who are up there among the top eight teams in the country so from that point of view it's exciting," says BBC Sport NI pundit McHugh. "They all have the potential to go deep into the summer and Monaghan are the best team in Ulster in my opinion. "Football is changing from an era when it was very defensive. Dublin and Kerry have changed, Mayo always have played that way, and Monaghan are more attacking now. "Looking at the league this year, Donegal are mixing things up but Tyrone are going to have to change. "If they want to be in the 'Super 8s' and win matches in it going forward they are going to have to play a more attacking style. "I think we could have at least four Ulster teams in the All-Ireland SFC quarter-finals but it's all to play for before that - because everyone wants to win an Ulster Championship." Can anyone spring from the pack? McHugh is disappointed with the decline in some counties who are no longer regarded as potential provincial winners. "Where are Derry, Down and Armagh? You just don't know, but they were three massive teams in the Ulster Championship. "Hopefully they will come back again but sometimes when you slip, it's dangerous. "It's disappointing because they are big football counties but Armagh could be the one team capable of a surprise. They are putting in a massive effort." From reading between the lines Fermanagh aren't going well. They didn't go well in the league and then lost a few players with injuries and players leaving. A few challenge games haven't gone well either. It's going to be hard for wee Pete [McGrath] to lift it. They have a small pick so I expect an easy enough victory for Monaghan. I've always said Antrim produce as good a footballer as anywhere else in the country but looking at how they went in the league, I expect Donegal to win comfortably. We lost seven experienced players, but it was time. There is a lot of hype about the Under-21s but the future is bright for them. It's a very big year for Tyrone. They have a lot of good players in Tyrone but the only fear I have, especially up front, is that they're all very alike. They don't have a different type of player or a ball winner inside. There is great club football in Derry but a lot of players aren't prepared to give that massive commitment and not win anything. You can't blame players because I've seen at first hand the commitment required to get to the top and stay at the top is just unreal. You give your whole life. The minute Jamie Clarke came back, Armagh started scoring goals. Like Michael Murphy for Donegal, it takes two players to mark him and that helps other players around him. You need at least Down or Armagh at that top table and I know from listening to players that there's a lot of respect out there for the Armagh management and players. They are putting in the same effort as Dublin, Donegal or Tyrone. I expect Monaghan to be going to Breffni Park to face Cavan and a local derby takes on life of its own. I know from managing Cavan, there is no fear of Monaghan whatsoever. It is a great rivalry. But I think Monaghan are the best team in Ulster. They have the best goalkeeper, the best defence, their midfield is very strong and Jack McCarron is an exciting player. He's a huge addition to the attack to help Conor McManus. The Ulster semi-finals should be Donegal v Tyrone and Monaghan v Armagh, with possibly a Donegal v Monaghan final. Monaghan are the most exciting team because they're just at the right age and if they're going to make the big breakthrough, this could be the year to do it. Fans will have the chance to watch any games shown on BBC Northern Ireland, on the BBC iPlayer on a range of devices.